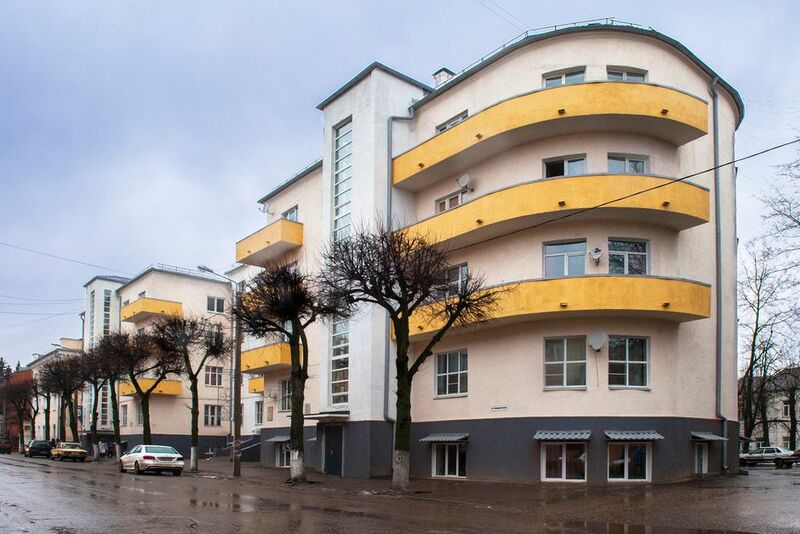 If you are offered to look at the building, located on the Communist Street, b. 5, and then, closed your eyes, try to describe it, then surely you will start to imagine figures of lions, located at the main entrance. Not many will be able to recall the avaricious, uncluttered architecture of four-storey building, built in the style of constructivism. And it was this solemn march grand entrance with concrete sculptures of lions lying absolutely not peculiar to constructivism, which is characterized by brevity and functionality. The building was built in the late 1920s — early 1930s (up to 1932). According to a plaque placed on the building, in this house from 1932 to 1937 lived and worked as a Civil War hero, the Corps Commander E.I. Kovtiukh. «And those that were dressed and fed a plurality of rows face to face with iron ranks emaciated, naked people, they felt orphaned in this untested triumph and asks unashamed tears in the eyes, broke ranks and, washing away everything, moved to the avalanche destructional wagon, which was ragged, half-barefooted, emaciated Kozhuh. And it rolled to the edge before the steppe: Our farther!! Lead us, where you know … and we’ll put down our heads! 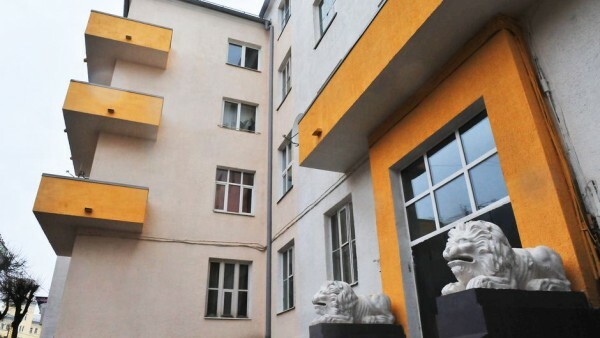 It is necessary to carefully get a grasp of these lines — and find all the hidden image of the house with the lions: you are in a simple but massive facade of constructivism and «iron rows of emaciated, naked people,» and «mass … which is called the Soviet Russia», and the main entrance lions (symbol of courage and bravery) «dressed and well fed,» which «felt orphaned in this untested triumph», but with all the willingness to throw the feet: «Lead us, where will we know … and their heads put down!» So it becomes palpable the image of the house, you see him as a hero of the novel. «House (name of the » Iron Stream » Heroes), where in 1932 — 1937 lived and worked as a Civil War hero, E.I. Kovtiukh «today is the object of cultural heritage.